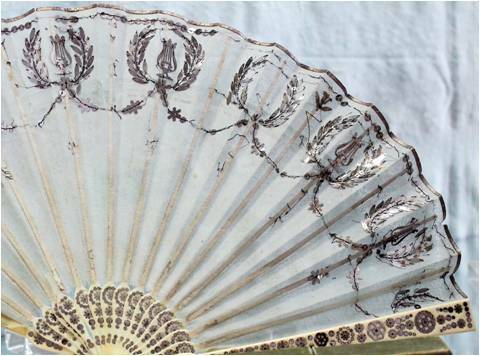 Sit back and enjoy photos of beautiful or interesting fans made between 1770 and 1815. Occasionally a plot bunny hops in, inspiring you to make use of fans in your Regency Novel. You can click on each photo to enlarge it. 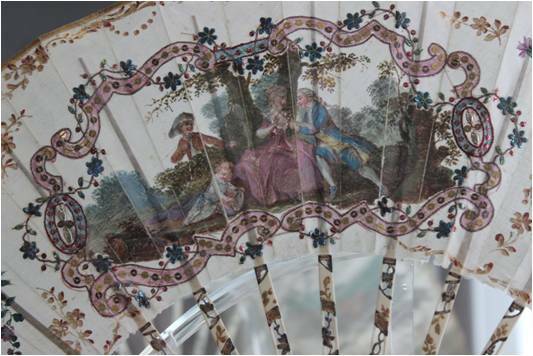 The fan below, made in 1770 in France, is painted with a “bergerade”-motive. The central painting shows elegant figures in a park or garden, possibly escaping the formality of court life to enjoy a flirt. Very much “Marie Antoinette at Petit Trianon”. Plot bunny: A fan like this could be carried by a more conservative lady, frowning upon revolutionary France. 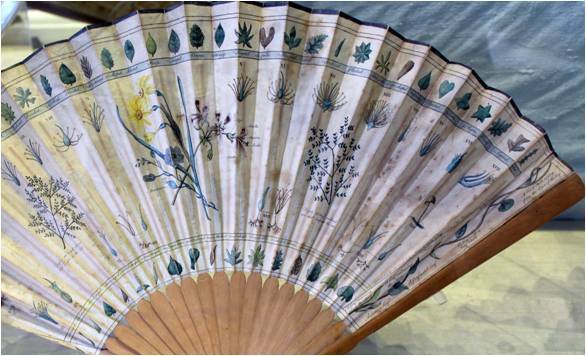 This fan (below), made in 1792, is beautifully painted with seeds, leaves and plant on one side, on the other side there is a list of the 24 orders of botany. Plot Bunny: You could use such a fan for the daughters of the second scientific revolution. Maybe the heroine is studying botany, so an admirer gives her a fan like the one on the right side. She is so pleased that she can talk of nothing else but botany for an hour, nearly driving her suitor away. 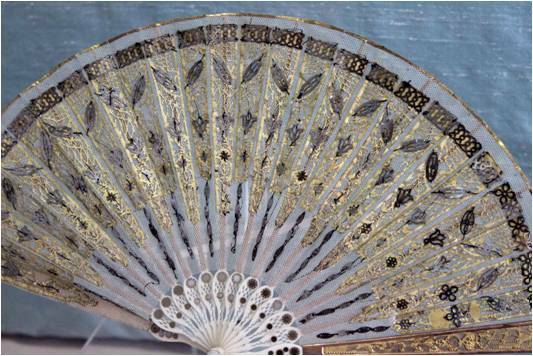 I like the elegant white-and-gold design of the fan (made ca. 1795-1800). Much to my surprise I learned that the silk leaf originally was blue. It is faded now, but actually I prefer it like this. The center of this fan features a painting of Venus riding in her chariot drown by two doves. Four putti surround her. 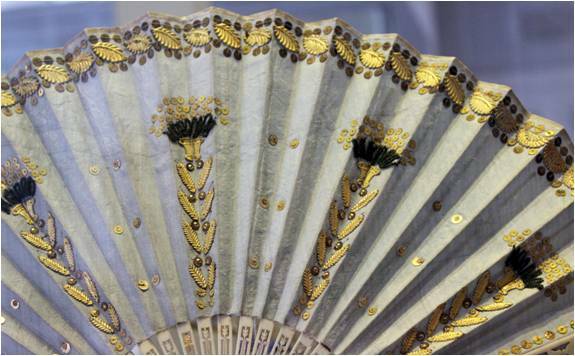 The brisé fans is made of ivory around 1800. Plot bunny: This is fan for a lady ready for flirting. Is she a beauty who considers herself a Venus, playing with her many admirers until she falls in love – with a man who doesn’t seem to care for her? 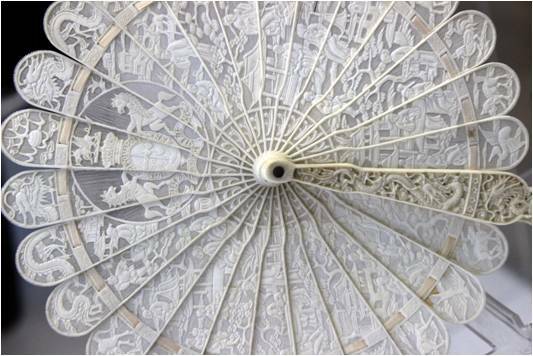 Also made in 1800, the ivory brisé fan below is decorated with a central medaillon of Angelica and Medoro, two characters from the Italian epic “Orlando Furioso” by Ludovico Ariosto. Angelica was an Asian princess who fell in love with the Saracen knight Medoro. They eloped to China. Plot bunny: This is another fan for a more enterprising heroine. A strict mother or governess would collect a device with such a shockingly romantic and improper image i-m-m-e-d-i-a-t-e-l-y. 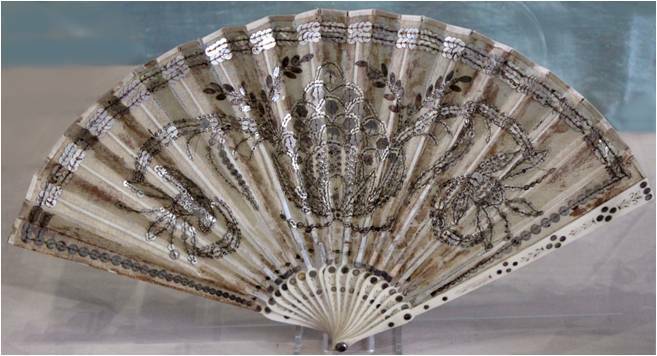 The year 1800 wasn’t averse of rich glamour: The fan below, probably French, is embroidered with sequins forming feathers. A rather bold design, if you ask me, but fine for an extroverted lady wearing violet, blue and gold anyway. More glamour here: This fan would certainly glitter brilliantly in the candlelight when being skillfully used by a coquettish beauty. The fan was made around 1800. The very striking French cockade fan was probably made in 1805. Cockade fans became fashionable around 1800. Plot bunny: Only a rich and influential lady should carry such a showy toy. Good taste might not be one of her fortes. 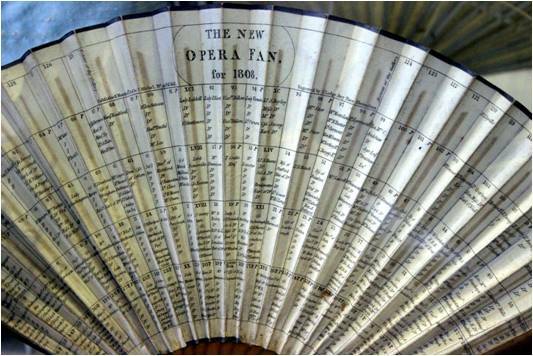 I am very intrigued by this fan, called “New Opera Fan”. The leaf shows the seating plan of the London Opera House in 1808. The famous dandy Beau Brummell is in box 25. Plot bunny: The New Opera Fan is a useful tool for a social climber trying to find her way in polite society. But she mixes up the boxes and instead of getting in contact with a viscount (as planned), she meets a handsome, young scientist who could not care less for balls and glittering event. Nevertheless, she can’t help but fall in love… . This is my favourite fan in the collection. It was made in 1810 of bone and is embroidered with cut-steel shapes and sequins. The painting “Caesar restores Cleopatra to the throne of Egypt” of the Italian artist Pietro da Cortona (17th century) served as a model for this fan made around 1810. 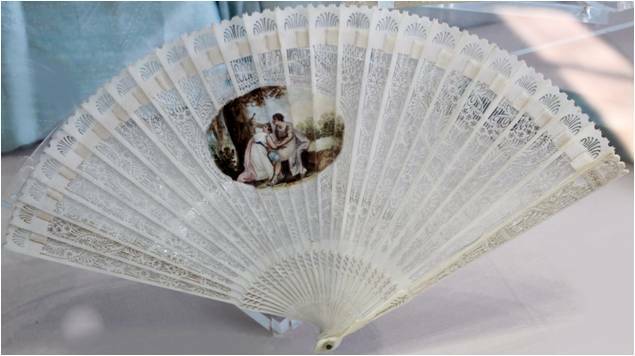 Plot bunny: The fan could be a gift to make amends to a lady who had been wrongly accused of infidelity by her husband. By presenting it to her, he acknowledge that he has done her wrong. But will she forgive him easily? 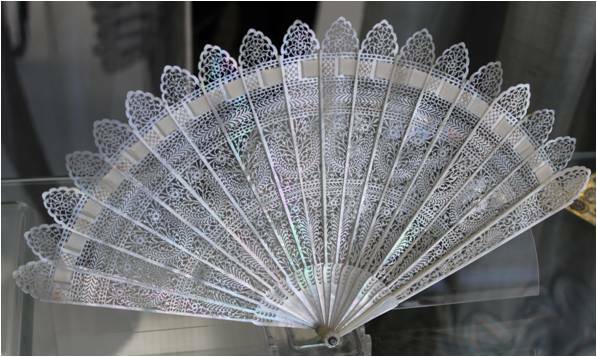 A fan for a demure, young heroine right from a Jane Austen Novel: A white cockade with only a touch a silver sequins, not at all showy, but proving excellent taste as well as propriety. The young lady would have her first season and would be dressed in white, of course. 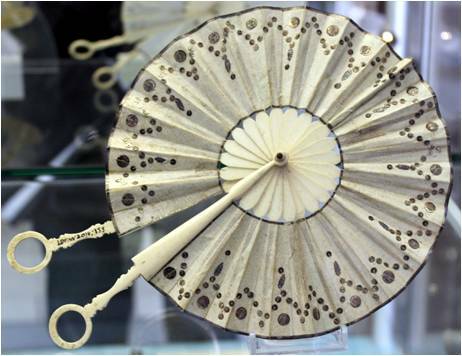 The fan was made in 1810 of ivory. A very pretty cockade brisé fan with the coat of arms of the Order of the Garter, an earl’s coronet and a Welsh dragon. Beneath is the motto “magistratus indicat virum” – “The ruler shows the man” of the Lowther family, Earls of Lonsdale. The fan was made in China for export to England around 1810. 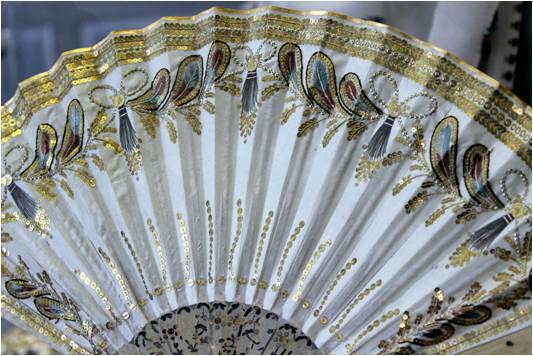 Plot bunny: Has this fan been misplaced by Lady Lowther, only to be found by the heroine? With the help of the fan, she pretends to be a member of the Lowther family and embarks on a ball for one glittering night. 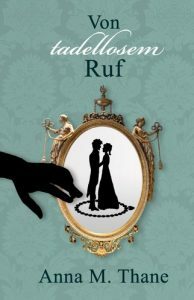 There, she falls in love with a handsome officer, and he with her – but how shall she explain to him later that she isn’t who she pretended to be? 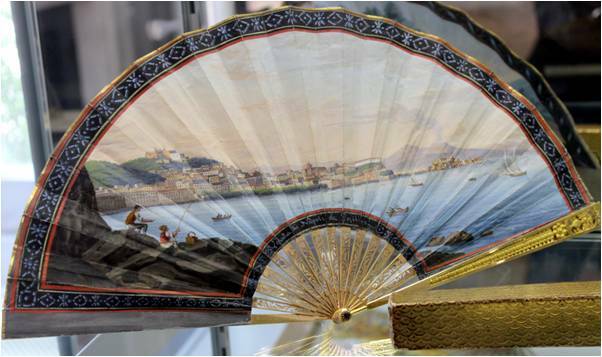 This fan (below) is a souvenir from Italy, painted with a view of Naples and the volcano Vesuvius. It was made ca. 1810. Plot bunny: A slimy young man returns from his Grand Tour. He has bought the fan to ingratiate himself with his rich aunt who loves Italian paintings. He wants her to make him her heir. Will he succeed? 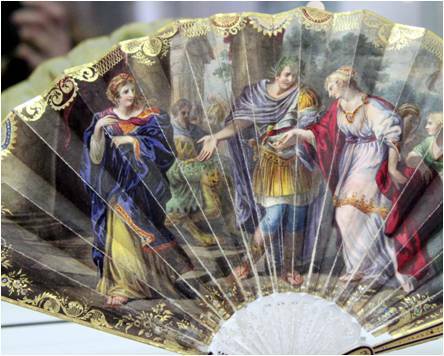 The fan below, made in France in 1810, is decorated with laurel wreaths surrounding a lyre. 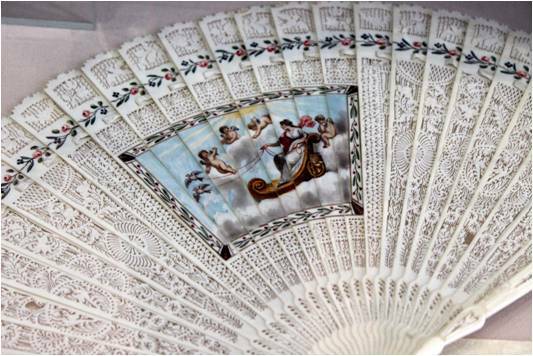 Plot bunny: The hero compliments a lady on her musical skills with this pretty fan. 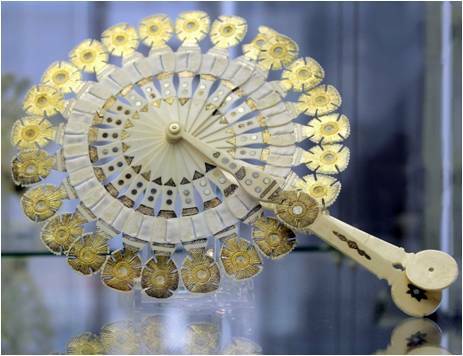 A fan made entirely of mother of pearl, pierced with flower and leaf ornaments, ca. 1815. Decidedly beautiful. The Fan Museum, 12 Crooms Hill, London SE10 8ER, Greenwich, UK. The Fan Museum is a great place to go for everybody fond of hand-held fans. Their collection is amazing, and they hold many exhibitions throughout the year. Next time you are in the area, you simply have to visit.